SMYNews: Kick Killer Cops Out of Our Community! Tell MPD To Fire The Gun Recovery Unit! Kick Killer Cops Out of Our Community! Tell MPD To Fire The Gun Recovery Unit! We just started a petition titled "Kick Killer Cops Out of Our Community! Tell MPD To Fire The Gun Recovery Unit!" On August 9, 2017, Law for Black Lives–DC members viewed a publicly-posted photograph of seventeen members of the Metropolitan Police Department's Gun Recovery Unit (GRU), including Officer Michael Vaillancourt inside of what appears to be an MPD stationhouse in police-issued uniforms and tactical gear. The GRU officers are proudly posing in front of a disturbing logo threatening the residents of the District of Columbia with violence and murder. 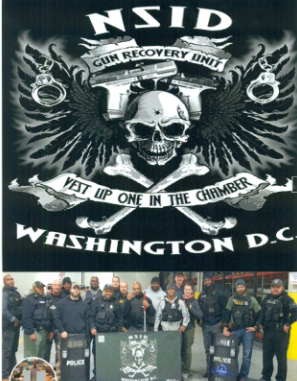 District of Columbia ("D.C.") residents have seen members of the Gun Recovery Unit, prominently displaying this murderous logo on their police uniforms while armed, patrolling the community, stopping and frisking individuals, and effectuating arrests. Local activists from Law for Black-Lives - DC recently filing formal complaints with MPD's Internal Affairs Division against officers in the Gun Recovery Unit and the 7th District "Powershift Unit. The complaints list an appalling number of MPD officers who have been seen in the community and at the courthouse proudly wearing shirts that flaunt symbols of white supremacy and symbols of death. These same officers have been seen wearing hooded sweatshirts printed with this violent logo inside of the DC Superior Courthouse while waiting to testify in criminal cases. The Gun Recovery Unit treats our community as an active theatre of war, tell MPD to stop them! Perhaps nothing makes this logo more abhorrent and repulsive than placing it in its appropriate context: Gun Recovery Unit members have been responsible for the recent shootings of Raphael Briscoe, Darius Jamal Murphy, and Mark George; tragically killing both Mr. Briscoe and Mr. Murphy. According to the Metropolitan Police Department's Annual Reports, between 2009 and 2015, twenty-nine people have been killed and twenty-eight have been injured by the intentional firearm discharge of an MPD police officer. After police shootings and killings, MPD often demands that the community not rush to judgment. It is unconscionable for the MPD to expect the benefit of the doubt when their officers shoot and kill Black and Brown citizens while boldly wearing a logo reflecting their cavalier attitudes towards police brutality and murder. The disturbing Gun Recovery Unit logo prominently features a skull and crossbones, universally understood to be a symbol of death. Through the center of the skull is a single bullet hole—indicating the individual had been shot in the T-zone, a virtual guarantee of death on the first shot. Directly above the skull and crossbones are not one, but two handguns, with handcuffs on either side of the image. Below the image of the skull is a flag reading "vest up one in the chamber"—an admonition to officers to put on a bulletproof vest and to load their firearm with a bullet in the chamber, ready to shoot civilians. By placing "NSID" (the acronym for the Narcotics and Special Investigations Division of MPD) and the "Gun Recovery Unit" on the graphic, the logo clearly sends the message that the Metropolitan Police Department endorses the message captured in the logo. These symbols are offensive and indicate systemic bias in the policing of Black people. Join us to fight back. The use of this logo is part of a broader campaign designed to inflict terror on low-income communities of color. For the longest, community members have voiced their fear of the Gun Recovery Unit and concern with their policing tactics. For many in the community, the Gun Recovery Unit has become synonymous with "jump outs"—a policing tactic involving officers literally jumping out of unmarked vehicles, often with their weapons drawn, to illegally stop individuals without justification. "Jump outs" happen at any time, leaving individuals with no recourse against them. This maligned practice ensures that Black and Brown communities live amidst intimidation and an ever-present threat of violence because, as the community well knows, and these officers proudly announce, the officers are "vest[ed] up, [with] one in the chamber." This provides corroboration to what communities of color in DC have long experienced—the policing of their community through intimidation and violence leading to the killing of community members at the hands of the police. On behalf of a number of community organizations and community members, Law4BlackLives-DC has formally filed complaints with both the Internal Affairs Division of the Metropolitan Police Department and the Office of Police Complaints regarding this logo and the message it propagates. This logo explicitly associates MPD with threats of death, violence, and the celebration of a climate of police brutality. We are asking concerned community members to let Mayor Bowser know that she must step in to check this culture for the people of Washington D.C. We also ask that the Office of Police Complaints and the Metropolitan Police Department conduct a thorough investigation into all threats of violence and murder by members of MPD against the residents of the District of Columbia. Officers who endorse and flaunt symbols of violence and murder are a threat to public safety. Silence by Mayor Bowser, the Metropolitan Police Department and the Office of Police Complaints is nothing less than a full endorsement of this logo's murderous message. Further inaction makes the Mayor, MPD, and OPC complicit in the killing of Black and Brown people by the police. Will you pledge to join the fight against racist policing? Join us and start your own petition on OrganizeFor today!